alison*elle | Vancouver fashion, beauty, and lifestyle blog: NYX Soft Matte Lip Cream in "Vancouver"
NYX Soft Matte Lip Cream in "Vancouver"
I've already shared my excitement about Makeup Revolution, a new line coming to Canada that I was introduced to at the London Drugs Beauty Event (#LDBeauty) last month. However, we also got the opportunity to play with some new launches from brands that are already well-established here. Those brands included one of my faves, NYX Cosmetics, and their new Soft Matte Lip Cream in "Vancouver" was definitely one of the stars of the show. Thanks to Jenn from A Beautiful Zen for snapping this pic of me getting my swatch on! The Soft Matte Lip Creams are a unique formulation: neither a lipgloss nor a lipstick. While they come in lipgloss-style packaging (tube and doe foot applicator), the texture is very creamy like a mousse and sets to a pigmented semi-matte finish. It's not a typical matte if you are looking for that type of look but the formula does mean it feels quite comfortable on the lips. The shades are all named after cities around the world so it was very fitting that "Vancouver" was being featured at #LDBeauty. 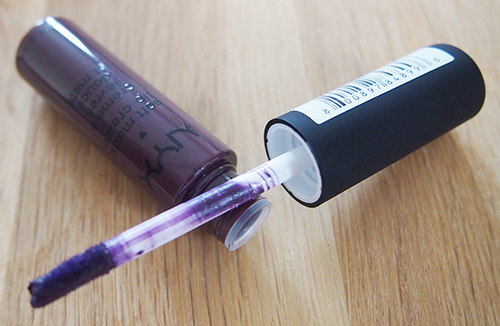 It's a gorgeous deep purple shade which honestly seems a bit weird for a Vancouver-themed beauty product. We have such a mild climate with next to no snow and I view this as being very Fall/Winter. I'm not complaining though! I actually love wearing deep gothy lip colours like this and you can bet I will definitely be rocking this in the cooler months. Find this Soft Matte Lip Cream along with other NYX Cosmetics at London Drugs. The colour is definitely gorgeous! very pretty shade, perfect for fall!